Successfully Added Mini Car Charger with Dual Port USB Simultaneous Charging for iPhone / iPad to your Shopping Cart. Introducing the Mini Car Charger with Dual Port USB Simultaneous Charging for iPhone / iPad, the cheapest and most convenient way to keep your iPad and iPhone powered up while driving around. Do you ever find your iPhone/ iPad, or any other USB powered device running out of power more often than you would like? If you are the type of person who spends more than 15 minutes a day in your car, put that time to good use and re-charge your iPad and iPhone with this Mini Car Charger with Dual Port USB Simultaneous Charging! 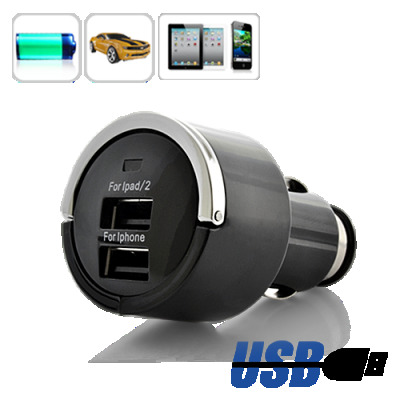 Featuring dual USB ports, this car charger allows you to charge your iPad and iPhone at the same time! It gives you the ability to keep yourself entertained on long drives with a fully charged iPad while also being able to keep your iPhone ready for that next business call. With its mini and compact design, you will love the convenience of being able to charge your iPad and iPhone at any time you want in the car. When you insert this USB charger gadget, you'll notice how space saving it is - it only sticks out from your lighter socket by 10 mm! Better yet, this Car Charger is extremely easy to use! Simply plug it into your car's cigarette lighter and you'll have the easiest way to keep your iPad and iPhone fully charged. Give your car the ability to recharge your iPad and iPhone at the same time. With the wholesale price, there's nobody who wouldn't use one of these, so order a few now and re-sell for maximum profit! Available in our warehouse now, add it to cart now and we'll express ship it out tomorrow! Brought to you by the leader in wholesale Chinese electronics and car accessories, Chinavasion. Will this work with in my Mercedes Benz S Class? This USB car accessory will work with any car with a lighter socket.